The other day I logged into SWTOR, delighted with the knowledge that I had a few hours to play, with no particular pressure to do anything specific, not even Conquest - I figured that I'd be able to do anything I wanted, finally able to work on some long-neglected character goals. I stared at the character selection screen for several minutes and then logged off. It wasn't that I didn't want to play, or that I had nothing to do... but when it came to thinking of specific goals, I felt lost. I didn't even know where to start. On the plus side: This got me thinking on why that was, which is why you're getting this blog post. In a level-based MMORPG with a narrative like SWTOR, progression basically consists of two parts: character progression and story. SWTOR puts more emphasis on the latter than most, but that doesn't mean that the former doesn't matter at all. Ideally these two types of progression should work in tandem. You find yourself wanting to level up to see the next bit of the story or vice versa. 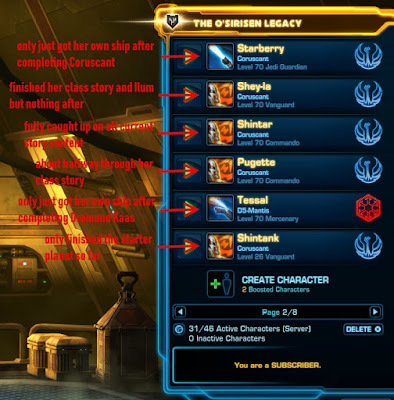 When things align properly, level also serves as a sort of signpost to where you should be in the story, so in SWTOR's early days, if you hadn't played a character in a while, you could just glance at their level and get a pretty good idea of where you left off, e.g. "Hm, that one's in her thirties; must have left her somewhere on Alderaan." However, even if you leave that aside, you're still left with levels having become largely meaningless. Basically, you'd have to play in a very specific and self-limiting way to not overlevel content as you go along, so you never have reason to look forward to levelling up - it just kind of happens automatically. I actually find it alarming more than anything else when one of my few remaining sub-70 characters gains ten levels in a single play session these days. The only way to remain low level is to basically not play at all, which I've opted to do on a couple of characters whom I'm "saving" to continue to have access to the lowbie and midbie PvP brackets. Aside from the characters mentioned above, almost my entire stable of alts has levelled up to 70 by now, more or less by accident and while still in hugely disparate places in the story, ranging from a few who are completely caught up with current content to those who've only just got their ship on Coruscant or Dromund Kaas. I do tend to always have a vague idea of where I left off - for example I've only taken a relatively small handful of characters through KotFE/KotET so far, so I do remember which ones those are, but if you were to put me on the spot and asked for example: "Hey, wanna level through Makeb with me?" I'd be staring at you like a deer in the headlights, because while I theoretically know that I've got quite a few characters who haven't done Makeb yet while technically being eligible for it, I'd have a hard time picking one on the spot. And that's why I had such a tough time with that character selection screen, to bring us back to the beginning of this story. I like a good narrative, but I'm also a big fan of character progression, and there's not much left of that. I suppose Galactic Command provides an alternate progression system of sorts, but aside from the fact that I already have more 300s than I care to count, you'll note that this is also something you pretty much need a spreadsheet to keep track of, since the character selection screen certainly doesn't give you any indication of what Command level each character is at either. Yet even if we ignore all of that and assume that I'd be happy to play my umpteenth alt just to see the story again, it's just a pain to keep track of where each character is at. And this is coming from someone who's been playing since launch and knows the game inside out. I dread to think how a returning player must feel when they go to their ship, see six different quests on their personal mission terminal and wonder what order these are even supposed to be in. It's not like their level is going to be any help. A random page from my character selection screen with notes on some things that are very much not obvious. So what can be done about this? Well, I suppose in my ideal world I'd like to see levelling slowed down again. We could keep level sync and just make it less OP. I know that's never going to happen though. I suppose a smaller thing that might help a little is if the character selection screen gave you the option to see more information about each character before logging in, such as what quests they are currently on or something. For now, I've settled on creating a spreadsheet to keep track of all my alts' mission progress. Just putting it together has already been quite informative and enlightening to be honest. (What? I can't believe I never did the Revan storyline on Shilu! Huh, I totally don't remember taking Tessal through Forged Alliances...) At the same time I feel that I shouldn't really need to have a spreadsheet for this kind of thing though. This is where I think that the leveling tuning needs to be worked on. It isn't rocket science, as Zenimax did it to a better degree for ESO than Bioware did for SWTOR, so it must be able to be tweaked better. The thing is, tweaking the leveling is likely lower down on the priority list for Bioware than working out other issues --and releasing new content. But I absolutely love the idea of better status info out of the login screen. It doesn't need to be too much more info, just a what planet and what Chapter you're on is frequently enough to figure a lot of things out. I wish I knew, but I have never felt that the combat became too easy while I've been leveling. With SWTOR, that happens a lot. While I'll chalk up some of my increased frequency of dying to the action oriented combat of ESO, some of the fights that are designed for a single player to beat are a lot tougher than I've experienced in a while in a low-mid leveling environment. I'd have to go all the way back to my first run through Eastern Plaguelands in pre-Cataclysm WoW for some of the tough mobs that I've experienced in ESO. And the multiplayer fights in ESO are truly multiplayer, as opposed to the "2+" world quests in SWTOR which are all soloable now. Now, ESO does make me choose more as to what abilities to use in a specific fight because SWTOR's UI allows me to place all sorts of abilities to fight with up on screen. ESO makes me think ahead of time (or, typically, after I got smacked around a few times) as to what abilities to slot in a specific fight rather than simply select a different button to mash. I really think it comes down to a fine tuning, because I don't think Bioware meant to have the leveling adjustment err so much on the side of "easy". But I'll mention one last thing: the ESO expac Morrowind now provides the intro questline into ESO, but at the same time Morrowind itself is a true expac so everything ought to be at top level. (Or it was before Summerset came out.) But I never felt like my first character was either over or under powered throughout the entire zone. Every time I thought I was getting up in power, I'd run into a troll or a pack of nix-hounds or something and I'd be brought down a peg or two. After I complete the original areas on my second toon, I'm going to go to Morrowind and see if my original assessment holds up going forward, but that'll likely be at the end of November at the rate I'm going. I am struggling to see the relevance of levels at all anymore. The "old" days had intrinsic rewards for levels - more skills, better chance to hit, etc... Nowdays, what's the purpose? I mean in the context of a bajillion levels. Objectively, what is the difference between level 50 and 69? Your numbers go up, but that's only in relation to the content your put against. Time to kill is the same. The skill level upgrades are in the same boat. You get more skill points (talents whatnot), but that could be done just by transferring XP gained into some other number. It's not a small change but my gut is telling me that levels are going the way of the dodo. They are more of a barrier than an achievement. I agree that games like WoW and to a lesser extent SWTOR have made levels less and less relevant, but I just wish we could go back and give them meaning again instead of scrapping the whole system. At their core, levels are a good mechanic, providing guidance and a feeling of incremental progress. I wouldn't call them "less relevant" - I think the normal "max level" is just the new baseline for the actual game. Some might say the endgame, but I'm torn on this. In WoW it's 100% the gear grind once you reach max level for the expansion (60,70,80,85,90,100,110,120 = 8th time now in 14 years vs 50,55,60,65,70 = 5th time now in SWTOR's 6 years..) whereas in SWTOR you not only get gear from Command Levels, although I guess that's the #1 driver as well. Sure, there are some activities that don't need max level or are even detrimental, but they are far and between. (I'm not counting syncing up for instances, as you'd be better off doing them at max level, it's just not a hindrance). I absolutely keep a spreadsheet of stuff about characters. Progression path, levels, equip, bag contents, and tons more. Would be nice to be able to access it programmatically like I did with WoW's battle.net API - but so a spreadsheet needs to be enough. And yeah, while I'm generally glad that SWTOR is addon-free, Altoholic is the one WoW addon that I still miss sometimes. It almost used to be an event when you levelled with a hearty "GRZ" evertime. Now however its oh another meaningless level. Which makes levelling very boring for me at least. Iirc EQ2 had a mentoring system where you could match the level of your group member in the area he was in. I'm no developer but we already have an item which turns off double cxp could we not get an item that keeps you at the level of the planet you are levelling on regardless of how much xp you get. So for instance your on tatooine which means you cant go above level 24 until you hit the next planet. It would laso have to have some sort of toggle. A small change which could make leveling challenging and fun again. As usual though I'm probably talking rubbish. I think the problem with allowing people to stop levelling completely would be players creating twinks in the lower level PvP brackets. Then again, at this point I'm not sure anymore that would really be the worst thing ever, considering that Bolster evens things out to some degree anyway, and those brackets are increasingly suffering from a lack of participation as it is. For me, SWTOR's attraction kind of fizzles out by Hutt Cartel. I've only managed to take my Mercenary through the rest of it. And Knight up to SOR. For me, replaying story on a character that's already done it is way too game-y and runs counter to the RPG elements of the game, which is why I avoid doing it with the KotFE/KoTET chapters too, even though it's possible there. The story quality of post-launch releases has certainly varied a lot, but there have been enough gems in there that I'm willing to slog through some of the stuff I don't like as much just to see the good parts again. The chief problem I have, is how each class story steadily went from individual, to faction, and by the time we hit KOFE, just one for all. So the experience looses it's appeal even more. Especially since I find non-force users rather crowbarred in to it. Can't disagree, but that's why the story splitting into separate Republic and Empire storylines again in the next patch has me quite excited and gives me incentive to get more characters up there.